Twitter can be a great way to distribute content to engaged followers. We can keep in touch with readers, potential customers and drive traffic to our websites. The challenge here is how to get more followers? 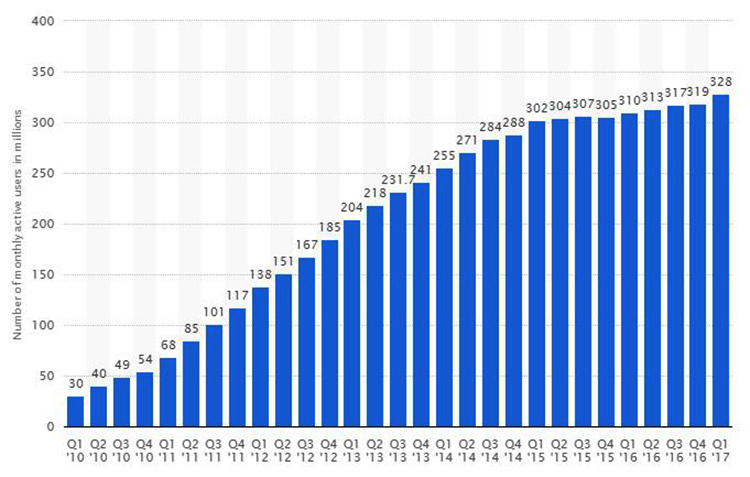 10 million from Q4 2016 (source). Although the grow is slow, the pool of potential users is there. To tap into the large potential audience, we need to build a constant stream of engaged followers. Like other social networks, it requires a commitment of time and energy in order to succeed on Twitter. Loper, a Twitter expert and trainer shares some of the primary keys he believes will attract new followers. Concise Profile Description – Think about how you want to be found in online searches. Photo – Current head and shoulder shot with a great smile. People want to connect with people. Background Banner, the most underused tool – A billboard to let the Twitterverse know who you are, what you do and how you can help them. Logos and eBook thumbnails can be posted here. Quality Tweets – Your Tweets should educate, entertain, enhance the lives of your audience, and create engagement. This is an opportunity to create trust and rapport that will differentiate you from everyone else who provides a similar product/service. Engagement Is Essential – People are watching to see how you will interact with others, so they can have an expectation of what to anticipate when they reach out to you. “Responding to RTs, mentions, new followers, commenting on the tweets of others, attending Twitter parties/chats are basic ways to start engaging and turning on the followers’ magnet,” he added. Scalice points out that the best way for us to get more Twitter followers in 2017 is to create a high volume of quality content and share it frequently. Twitter has become a noisy place. So in order to stand out, you need to provide more value than ever before. Scalice, growth marketing consultant at Earnworthy, does not encourage a user simply share low-quality content. If you want to get more Twitter follower in 2017, Janice Wald suggests following like-minded people on Twitter. Wald has blogged about some Twitter tools and methods that are often used. Here, she suggests 3 tools to help increase Twitter followers. Commun.It – Tool like this help you find like-minded Twitter users (Tweeps). It is the culture of Twitter to follow back, especially if you are like-minded. Therefore, if you follow them, and they blog about similar content, they will follow you back. Crowdfire – It’s a great tool that lets you know who isn’t following you so you can unfollow them. I advise keeping the number you follow under the number that follow you. Tweepi – Another great tool I use. I make sure I follow like-minded active Tweeps. Tweepi lets me know if I missed any. If I do, they will unfollow me out of concern for their ratio I just described. Tweepi helps me make sure I haven’t missed anyone. Today, to get more Twitter followers quickly, Lee recommends using tools like Social Quant to automate the process of finding and following people on Twitter. Social Quant [has] an algorithm that can find relevant and engaging people that are more likely to follow you back. This method is better compared to just blindly following people manually which is time-consuming and not efficient, and you’ll be following spam bots and individuals who aren’t targeted in your industry. “There’s a trap that a lot of marketers and business owners fall into… worrying about vanity metrics.” Adam Connell mentions that Twitter followers are another of those vanity metrics that can distract us from what matters. Connell has mentioned in his post over at Blogging Wizard. Your goal should be to grow a targeted and engaged following of people that genuinely want to hear what you have to say. This is a quick and easy win if you run a blog, and you’re actively trying to grow your email list. At certain steps within my auto-responder sequence, I add calls-to-action that encourage my subscribers to follow me on Twitter (and like my Facebook page). My CTA’s tend to be gentle nudges when in my email signature – you could do something more direct if you prefer. Sure, an easier way would be to add a prominent Twitter widget to my blog – maybe the sidebar. But the reality is that I get far better results from email marketing than I do from social media. So I prioritize accordingly. And while my Twitter follower growth is slower this way, the followers I do gain will be much more engaged. And if Twitter dies, I’ve still got my email list.. Earlier I mentioned the importance of having a following that wants to hear what you have to say. A great way to validate Twitter users that would be likely to follow you is to follow, connect and engage with those that share your blog posts on Twitter. To find who shares your blog posts, you could type your blog post URLs into Twitter’s search box. But, it only works with recent blog posts. I like to use Buzzsumo for this because they have a great data set. When I type my post URL, I get a sortable list of those who shared my post. I can then follow them directly from the app. And I can add them to an ‘influencer list’. But, this is only the beginning of this technique. Once you’ve followed people, you need to actually engage with them. That means doing more than liking/retweeting their posts – you need to converse with them. And better yet, help them out with something (that’s a quick way to become memorable). By doing this you’re creating a meaningful connection – one person at a time. The main way John Paul Aguiar grows his Twitter followers comes down to a few steps. These steps need to be done together and done each day. Share quality, targeted content from you or others, and that your followers will find helpful. Share that content consistently, be active DAILY. Be active about your following, learn to follow people and gain targeted new followers each day, week and month. Tomas Laurinavicius, a lifestyle entrepreneur and blogger from Lithuania shares the 3 important ways he used to grow his Twitter followers. One of the ways Alex Morrison uses to grow her Twitter followers is by creating and pumping out her own content. She thinks that Twitter can be a huge resource for bloggers to gain followers and also get new eyeballs on content. Create a schedule and stick to it. I put out a weekly blog post, so I have a steady stream of content to share. I use Social Jukebox to have a continuous loop of my best content. You need to use eye-catching images, and Tweet 10-15 times each day. Use 1 or 2 relevant hashtags with each post. When you can, include the hashtag #BloggersBlast. This account has over 30k followers and that hashtag will get them to retweet your post. Find relevant people, follow them, and see if they follow back. This is a huge time sucker and I started using Social Quant to do this for me. Use your other social profiles to cross-promote. Let your followers on Facebook and Instagram know how to connect with you on Twitter. Share other people’s content, thank people who share yours, and respond to any mentions publicly. People love this and it encourages them to share more of your stuff. You can automate a lot of things, but you can’t automate your engagement. The “^” symbol is synonymous with the word “insert.” Insert yourself into a conversation. For example, I inserted myself into a conversation with several influencers, and received 5-10 followers within 2 hours, and 30 visits to my site within 1 hour. A small example, I know, but that is the way it works. That is my tip, it is the whitest of white hat way to get more Twitter followers. I personally have almost 6000 Twitter followers, all of which I obtained organically. If you want to truly build your account on a mega-level, you need to put in the work. It is a full time job if you really want to do it right. The alternative, Commbe, a SEO blogger and author, says there are companies who use a bot to gain followers. “Or you can go the blackhat route, and use a bot. I’m not going to lie, it works for gaining followers. Lots of companies do it. “You can play the ‘follow and unfollow’ game or just automate things to the point where you get more exposure, and more opportunities to get more followers. Good luck!” he added. Ivana Taylor thinks that having right conversations with right people is important on Twitter. “I’m not sure that there is a new and improved way to get more followers in 2017.” She suggests to us. I would say that in 2017, it’s not as much about more followers, it’s about being included in the right conversations with the right people. The bigger Twitter gets, and the more people who pollute Twitter with spammy sales messages and links, the more energy you will have to put into creating a community inside your area of expertise. Taylor, the host for #BizapaloozaChat on Twitter believes that the best way to grow Twitter followers is to find and participate in Twitter Chats. Related article: A Complete Guide to Twitter Chat For Small Business Owners. The most effective way is to find your competitors on Twitter. Once you find your competitors, click to see who is following them. Those people will generally be interested in what your business has to offer too. If you follow these people, you’ll find a percentage will follow you back. The more you engage and provide good content in your Twitter feed the higher that percentage will be. Bill Gassett feels that the best ways to grow a following in any social media channel and especially Twitter is to reciprocate when someone shares your content. RE-tweeting someone who has taken the time to share your content goes a long way. We all want to see our name in the spotlight. RE-tweeting content is a great way to say thank you. Look for that person’s best tweet and share it with your network. You will pick up more followers naturally this way than any other. Gassett, an RE/Max agent, suggests a tool that works based on reciprocation and will help to increase followers. He added that if it’s only numbers you’re after and nothing else he believes the best way to gain more Twitter followers in 2017 is the same as last year – to follow others similar to you. Following other Twitter users is free, simple to do and the easiest way to build up a following fast. For example, I run a long-term travel blog so I follow other travel bloggers. If I go and follow a bunch of travel bloggers on Twitter right now, then a significant number will follow me back within a few days. Assadi Assadi, co-founder and CEO of Superhuman Labs, advises that we have to engage and interact with the people within our niche. He suggests staying away from short-term tactics that do little for engagement. Twitter requires deep, personalized reach outs and engagement. “In 2017, it’s less about quantity and more about relevant, targeted followers who are active and interested in your niche, industry, and content.” If you want to grow your Twitter followers, Meghan Monaghan states that you should tweet informative, engaging, non-promotional content more frequently. She adds that to grow your Twitter followers, you need commitment. She also suggests 3 simple processes to follow. Routinely follow new people and unfollow those who don’t follow you back so that your follower/following ratio stays balanced. Tools such as Social Quant or ManageFlitter will help you continuously reach out to new followers and grow your community with less manual work. Finally, users expect engagement, so participate in Twitter chats regularly to meet new people. Respond to mentions and reach out to others frequently. Madeline Osman actually has a few quick tips for us to grow our Twitter followers. Optimize your bio, including a clickable link (Your LinkedIn profile works if you don’t have a website). [Add] content multiple times/day, including a mix of original tweets, and relevant news items. Buffer is a great tool to help plan content ahead of time. Join and actively participate in industry Twitter chats to organically grow your presence with relevant followers. Use social media automation on platforms like IFTTT or Archie to multiply your efforts, but NEVER auto reply or auto direct message other users – it’s easy to see through. Lilach Bullock, a professional speaker and a social media specialist, has a unique way to grow her large followers on Twitter. And one of the best uses for influencers is for increased brand awareness, which leads to more followers. So this year, connect with as many influencers as you can so that they will share your content and help you gather more targeted followers. What can you expect if you follow Bullock’s advice? When it comes to gaining new Twitter followers, Jacob Cass thinks cross promotion is the key. Cross promotion is the key for gaining new Twitter followers, or any platform for that matter. Consistently offering valued tweets that speak to my followers. Following and interacting with those in my industry. Researching and using hashtags that find others who interact and engage. 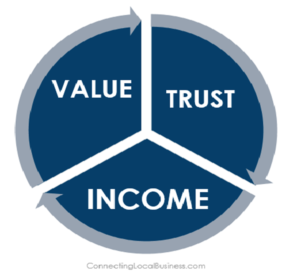 “Value becomes trust and trust leads to clicks and ultimately, a conversion of some sort,” she added. Graphic created by Chris Carroll on her social media as a reminder. Tiru is hoping to grow his Twitter followers up to 50k in 2017. He will be trying out something new. Obviously tweeting often, adding the right hashtags and images and tagging people will help a lot and I’ll continue doing that, but I’m also curious to see how many followers I can gain via my blog. In the coming months, I’ll be experimenting with growing my Twitter following with the help of SumoMe’s Smart Bar. Maybe we can try to follow the method that Tiru is using. People regularly ask me how I ended up with so many Twitter followers. The method we’ve always used still works in 2017. Share great content and include your username in the tweet; we use Dlvr.it to automatically share the very best writers as soon as they hit publish. Follow people in your niche, share their content and interact with them. Use MavSocial to schedule media-rich tweets. Promote our best content using ViralContentBee. Get more shares using JustRetweet. Gardner, a small business marketing strategies specialist, also share the SlideShare Julie Weishaar created from all her posts on Twitter best practice. Carmichael adds to not expect amazing results if you’re not putting an amazing effort in. Create tweets that you want to show your grand kids one day. Post only the content that you are really proud of. Are you creating at that level? That’s why you don’t have the Twitter followers you want. Your follower count is exactly what you deserve to have. Your actions have brought you to this point. On Twitter take a holistic approach by having all the information practically in one tweet. The message, the link, a photo with users tagged in and of course the relevant hashtags. Give as much power to the tweet as you can! Promote your Twitter account on your website, including a “Follow Us” section of badge somewhere. Promote your Twitter account on your other social accounts (e.g., Facebook, Instagram). Publish great stuff so that you get many retweets and shares. Find people with Twitter accounts (search on Twitter for related hashtags) on the same niche and swap recommendations to follow each other. The website has over 75k Twitter followers – I’m sure Scocco has put in a lot of hard work. Mitt Ray does one thing before sharing any piece of content on Twitter, “You need to determine if your audience will find it interesting. Ray, the founder and CEO of Social Marketing Writing, feels that building up the wrong followers will hurt your engagement rate. Sometimes people tweet irrelevant content in hopes of attracting all types of followers and quickly building up their following. The problem with this is that they end up alienating the followers they already have. They also attract the wrong followers. This not only leads to a loss in followers, but also a decrease in engagement rate. Hence, he advises if we are very specific about the type of content we share, we will attract highly relevant followers and our Twitter engagement rate and traffic will be high. “Getting started on Twitter can be a challenge.” Ben Brausen actually thinks that even with great content, it’s hard to grow a following on Twitter if no one knows we exist. To overcome that challenge and grow your following, you’ve got to let them know you’re there. Brausen, a journalist and educator, advises the process can be broken down into 3 phrases. The first phase is to get the basics done. The second phrase is to shout out your content to potential followers. The third phrase is to be consistent. “Focus on freshness and relevancy.” Schachter, the founder of Optimizepri.me, suggests a few platforms and services to find great content. You can use services like Google Alerts, Talkwalker, relevant subreddits, and your own RSS reader to find new and interesting things to tweet. You’ll gain followers just by showing you’re active and providing value. “Finally, be personable. Respond to tweets, talk to people, retweet, and share the love,” he added. In 2017, they are doubling down this strategy on thank you pages. Gamez shows us some of the examples how he utilized the strategy. For example, once someone opts-in to receive a lead magnet, the thank you/confirmation page might ask them to do two things (on that page) to unlock a bonus video training. Thing #1 would be to answer a question (like, “What’s your #1 challenge right now?”). And thing #2 would be to follow on Twitter. Showcase your skills. Twitter is a great place to show off your talents, especially writing and photography. If you are a writer with informative, pertinent content, put it on Twitter. Same goes for amazing photos. People will share your articles or images and this will give you visibility to more admirers. Here is the post Tran wrote in Entrepreneur.com. Although the post is not the latest, the tips are still relevant. The topic of growing Twitter followers is certainly not new. I have reached out to experts from a various background such as blogger, marketer, real estate agent, author, speaker, entrepreneur, etc. for advice. Here are the things seemed to come from most of them. Build a targeted audience. Quality over quantity. Twitter is a noisy place. Post quality content that interests your audience. Interact with followers, respond to Tweets and join Twitter chats. Include Twitter account alongside other marketing campaigns. Use tools, platforms, and services to manage Twitter account or search for content. We must not overlook the basics. Appreciation to all our friends for taking the time to respond to our topic on how to get more Twitter followers in 2017. I’m sure these tips offer some ideas to re-align our Twitter and social media marketing strategies. 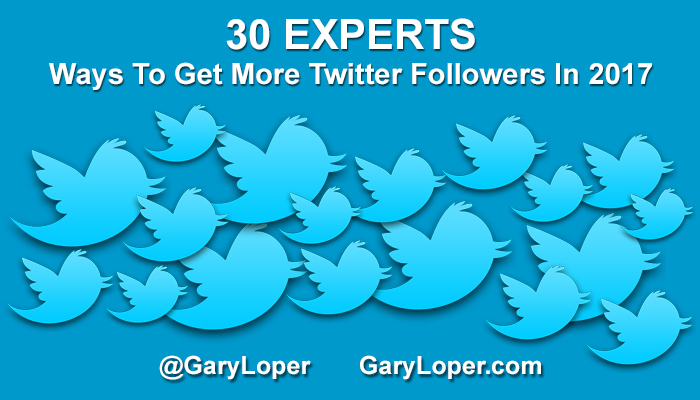 If I would offer you tip #30 to start growing your Twitter followers – Say “Hi” to the people above. Enjoy! If you have something different to add in, do let us know on Twitter or Facebook. Jason is a social media manager for hire who offers SMM services to tech startups, solopreneurs and small businesses. He aims to deliver the best results for his clients. You can find him at Next Social Startup. Next post: Are You Unique On Twitter?